Melbourne Cup sweeps are easy to run and give everyone a chance to be a part of the race without doing hours of form and study. Having a go in a sweep is an Australian way of life in workplaces and social clubs throughout the country, becoming the focus of the day’s festivities. In this Melbourne Cup sweep guide, we’ll go through what you need to make your sweep a success, the laws and history behind the sweep and some more tips on what to avoid. How does a Melbourne Cup sweep work? Setting up a Melbourne Cup sweep is as necessary to a Melbourne Cup barbecue as the beer, meat and a big-screen TV. The first thing you’ll need is a dedicated sweep page from your newspaper or online. Alternatively, keep your eye on this page in the lead up to the race for an easy-to-download PDF that you can print off as many times as you want at home. After you’ve got the entire racing field at your disposal on paper, you’ll cut up each horse individually, fold them so the identity can’t be seen and place them all into a hat, to be drawn out by participants. 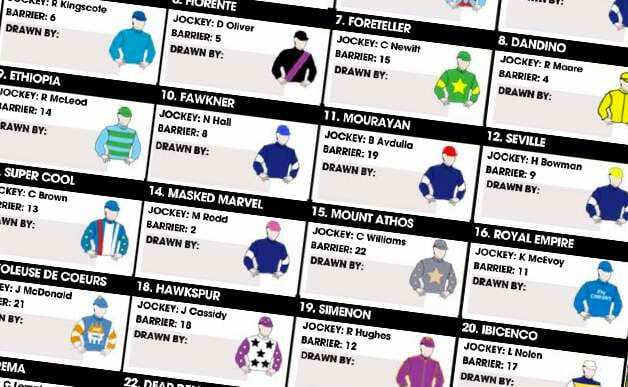 Each ticket should have the horse name, jockey, trainer, number and barrier details. Each person competing in the sweep will draw a horse randomly from the hat and the host will record their names on the official sweep page where it says “Drawn By”. An example of how your Melbourne Cup sweep page should look like. Note: Also keep an eye on our recommended online bookmakers, who will often have a bevy of Melbourne Cup sweep generators ready for their members. How much money should my Melbourne Cup sweep be worth? Sweeps in Australia are usually run for money, and anything from $1 per horse to $2, $5, $10; right up to $100 per horse is the norm. In Australia, sweeps are normally run for a small prize pool to make things interesting. If you sell 24 tickets at $5 each, you will have $120. If you want to be charitable, you can offer last place their money back, but that is not encouraged by the team at CupsBetting.com. Is a Melbourne Cup sweep even legal? Why did you even ask this question? Do you have a lawyer, police officer or uptight person coming to your party? Yes, of course the Melbourne Cup sweep is legal. As long as the host doesn’t profit from it, obviously. Victorians can legally host a sweep with a pot of up to $5,000 and in New South Wales that total is $20,000.